Scrooge Video Slot Guide & Review - Casino Answers! Scrooge is a 5-reel, 50-line video slot developed by Microgaming, featuring a wild symbol, scatter wins, multipliers, a free spins feature and a bonus game. You can play the Scrooge video slot at Bovada. Coin values on the Scrooge slot machine are $0.01, $0.02, $0.05, $0.10, $0.20, $0.25 and $0.50. You can select from 1-50 paylines and from 1-10 coins per payline on the Scrooge slot game. You can bet as little as a penny on the Scrooge penny slot machine and as much as $250 per spin. The Scrooge online slot game has an excellent betting range for both casual players and high rollers. You can play the Scrooge video slot by selecting your bet and pressing the “Spin” button. If you want to play the maximum bet of 50 lines at 10 coins per line, you can also use the “Bet Max” button to spin the reels. The highest paying symbol on the Scrooge video slot is the Scrooge Logo symbol. If 5 Scrooge Logo symbols land on a selected payline, you will win the 6000 coin top jackpot. The Scrooge Logo is wild and will substitute for all symbols except for the scatter symbol. It will also act as a 2X multiplier when completing winning combinations. At the top of the screen, you will see a Xmas countdown calendar and a free spins counter. Whenever you get a winning combination on the Scrooge video slot, you will be given the chance to pick one of the symbols in the winning combination. The symbol will either add done day to the countdown calendar or add one free spin to your counter. You may only open one spin per spin, even if you get multiple winning combinations. Clicking the “Spin” button will randomly open a symbol. Once you get to “Dec 25” (or Christmas Day), the free spins feature will be triggered. 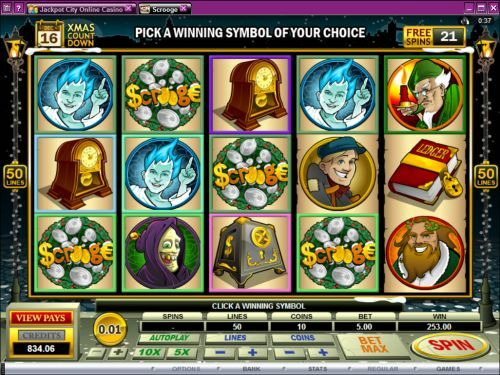 During the Scrooge free spins feature, being that it is Christmas Day, the symbols will change to much happier versions of the symbols. All wins on the free spins feature are doubled. 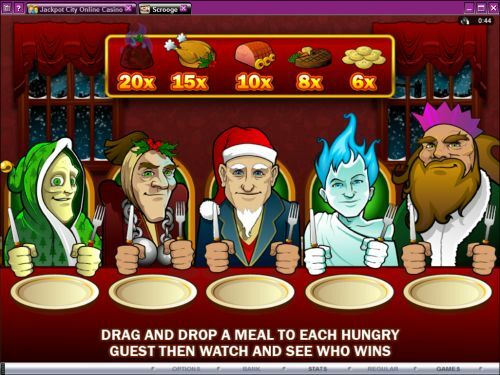 The Xmas Dinner bonus game can be triggered during the free spins feature. On completion of the free spins feature, all counters are reset to “Dec 1” and 3 free spins. The free spins feature cannot be re-triggered. A starting value of 3 free spins is aawrded. All lines played are the same as the spin that triggered the feature. You can win up to 120,000 coins with the maximum bet from the free spins feature when you play Scrooge at Bovada! Only highest win is paid per selected line. All wins pay left to right, except for scatter wins (which pay any). All wins are multiplied by the bet per line, except for scatter wins. Scatter wins are multiplied by the total bet. Scatter wins are added to payline wins. To use the autoplay mode on the Scrooges online slot machine, you must hit the “Expert” button. You can now play 5 or 10 autoplay spins. For advanced settings, hit the “AutoPlay” button and you can now play 5, 10, 25, 50, 100, 250 or 500 autoplay spins and stop autoplay if a win exceeds or equals $100, $500, $1000, $5000 or $9999. You can stop autoplay at any time. Autoplay will stop on any feature contained in the game. Unfortunately, due to the “pick a symbol” aspect of the free spins feature, the autoplay mode will stop on any win on the Scrooge video slot. This severely hampers the autoplay mode and is almost surely an oversight that will hopefully be fixed one day. Scrooge is a very well done video slot by Microgaming. It takes a famous Christmas story and does an excellent job of adapting it to video slot form. The free spins feature in particular is a very interesting twist that is very refreshing to see. You can play the Scrooge video slot for real money when you sign up and make a deposit at Bovada! Where can players from the United States play the Scrooge video slot for real money? Unfortunately, American players cannot play the Scrooge online slot game for real money at this time. Americans can play a whole lot of other Christmas themed video slots at Bovada. Is there a flash game of the Scrooge free slot that I can play in my browser? Yes, you can play the Scrooge video slot in Instant Play mode with no download required at Bovada. You can play for free or you can play for real money. If you have problems with the Flash casino, we recommend updating to the latest version of Adobe Flash Player. How do I trigger the Scrooge free spins feature? The free spins feature on the Scrooge slot game is triggered when the day calendar at the top of the screen reaches “Dec 25.” To get to December 25, you must pick symbols from winning combinations to add a day to the calendar.